Dairy owners, veterinarians and employees all play a role in helping dairy producers rise to the challenge of marketing residue-free beef and milk to ensure a viable marketplace for these products. Residues refer to the presence of drugs, drug metabolites and/or pesticides in meat or milk. The presence of residues can cause reactions in consumers who are allergic or sensitive to those drugs and sometimes may prove fatal. Antibiotics can also interfere with starter cultures in yogurt and cheese. Therefore, it is important for dairy producers to adopt livestock practices that ensure better livestock health, reduce treatment costs while working with their veterinarian to ensure that antimicrobials are judiciously used and the chance of drug residues in beef and milk are minimized. The points outlined below will help the dairy producers in developing a drug residue prevention plan. A veterinarian can advise about proper use of each drug and corresponding withholding times. It is illegal to administer drugs in an extralabel manner without the guidance of a veterinarian. Within a veterinarian-client-patient-relationship (VCPR), a veterinarian can submit a request regarding extended withdrawal intervals for extralabel treatments on behalf of a dairy producer at the website of the Food Animal Residue Avoidance Databank (FARAD). 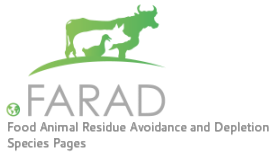 FARAD is a free service that helps veterinarians determine extended withdrawal intervals when drugs are used in an extralabel manner based on available scientific data. The involvement of a veterinarian in the management of a dairy farm will help to maintain a healthy herd and ensure residue free produce of the farm.​ Get a VCPR agreement form. Whenever a treatment is given, it should be recorded. The treatment records should include; name/tag number of animal treated, date of treatment, drug and its dose and route of administration, milk or meat withholding times if any. The record should be signed by the herd veterinarian or producer. Drug withholding times are different for meat than for milk. Having a written record of each treatment with withholding time will help the dairy producer to determine when the milk from that animal is safe to add to the bulk tank or to sell the animals when their meat is free from residues. Download Template Treatment Record. All the drugs should be stored in a locked drug cabinet. Drugs approved for treatment of non-lactating cows must be stored separately from drugs used to treat lactating cows and respective shelves identified. Dosage of antibiotics used intramammary for dry cows is often higher than the dosage used in a lactating animal. Many drugs require cool storage, and keeping them in a windowsill or in sunlight can make them ineffective. Limit the access to the drug cabinet to designated staff only. Only trained employees should be allowed to treat animals. This gives the workers accountability, and lessens the chances of mistakes and carelessness. Never exceed dosage for OTC drugs and follow veterinarian's directions for prescription or extralabel drugs. A double dosage does not double the effectiveness. Administer treatment for as many times as indicated on the drug label. If drugs are administered extralabel, get specific recommendations from your veterinarian regarding treatment, withholding times and appropriate drug residue tests. Discuss all aspects of treatment with your veterinarian and have a treatment plan for the sick animal. Don't treat those animals where the chance for recovery is low. Combining two drugs may change their efficacy, toxicity and withholding times for meat and milk and their withdrawal times would not be known. Even if the goal of the dairyman is for all animals to enter the milking herd sometimes they don’t make it to that stage or stay in the herd as planned and get sold for beef. When that occurs, it's important that the meat withdrawal time for any previous treatments be followed in order to prevent a residue violation. Accurate observation of the withholding period requires identification at the time of treatment. A good method is to double mark cows before treatment with special tags over existing numbers or tags in the fetlock region of leg which have space for entering the date and time when milk can be saved or cows can be slaughtered. Double marking is good insurance if one marker comes up missing. ​Separate treated cows from the rest of the herd and milk them last as an additional precaution to avoid contaminated milk from entering the bulk tank. If possible, using separate equipment has also been shown to reduce the risk of bulk tank contamination. The person responsible for milking should have a list of treated cows and should verify before milking begins. Keep milk from treated cows out of the bulk tank for as long as the label recommends, even if it tests negative. With the help of your veterinarian create a detailed inventory of FDA approved drugs on the farm, their dosage schedules, clear instructions for administration with milk and meat withholding times. Always keep high-risk drugs (PMO prohibited drugs and drugs with no extralabel use in food animals) off the farm. Drugs used in an extralabel manner should be properly labeled by a veterinarian for "extralabel" use. If cows are treated extralabel, the extended withdrawal intervals must also be indicated as well as how the milk should be tested prior to adding to the bulk tank. Treatment protocols should be reviewed at least yearly with your veterinarian. Get a sample drug inventory form. ​​Refresh the knowledge of employees by providing training every six months on proper administration of treatments and record keeping. Train new employees first before allowing them to execute treatment protocols. For example; drug infused into one quarter can reach all quarters through blood stream. A trained worker knows that milk from all the quarters of a treated cow should be discarded. Follow the feeding and withholding instructions if medicated feeds are to be used. Store medicated feeds in a separate facility from lactating cow feed ingredients to make sure that these feeds do not contaminate the feed or water supply of the milking herd. Cleansing agents and pesticides should be stored away from the feed and used carefully to avoid contamination.